A recipe that’s beyond simple, yet bursting with flavor! Find some beautiful rosés beyond Provence. Tasty burgers for your summertime barbecues. Dry and refreshing, these pink wines should be your go-to summer drink! Many people are intimidated to cook fish and have told me they usually just wait to order it in a restaurant, rather than preparing it themselves. They're afraid of ending up with an overcooked, dry and chewy fillet. Yet there are so many simple ways to cook fish: broil, bake, grill, saute, fry, roast. If you follow one general rule of thumb, moist and delicious fish will be yours! This rule is to cook the fillet 8-10 minutes per inch of thickness. There are certain exceptions to the rule, such as for salmon and tuna which are usually served rare in the middle and therefore require less cooking time. Below is one of my favorite recipes for cooking salmon which needs only about 6 minutes per inch of cooking time. This preparation is so easy to make and you can either broil or grill the fish. Bon Appetit! Slightly rare in the center, this salmon is perfectly cooked! 1) Mix together honey, mustard, vinegar, cumin, coriander and chili powder. 2) Lay salmon fillet on a foil-lined baking pan, skin side down and brush marinade all over the top of the fish. It should be a fairly thick coating. Marinate 20 minutes to one hour. 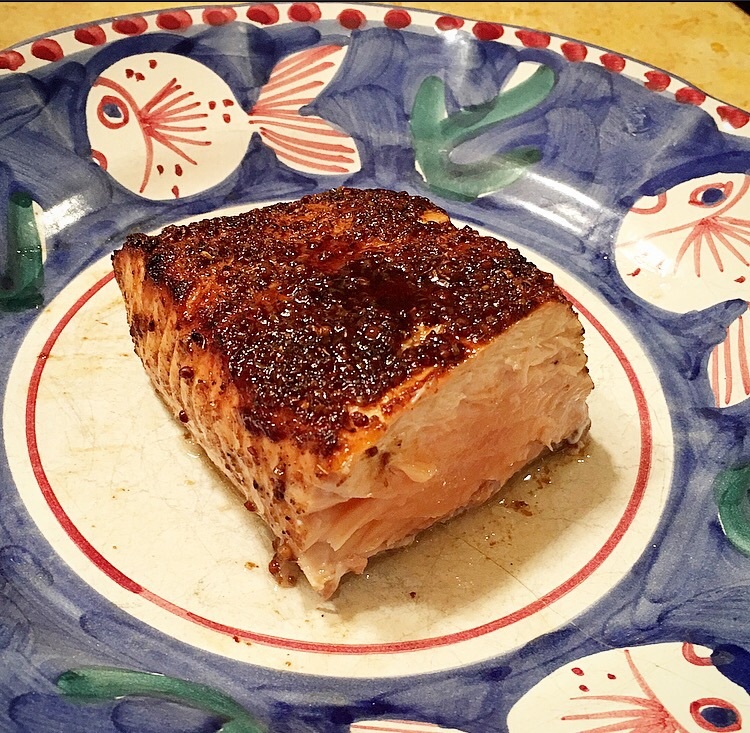 3) Broil or grill salmon without turning, until opaque and slightly rare in the center, about 5-7 minutes. Serve with rice, quinoa or couscous and sauteed vegetables, such as these simple but fabulous Sugar Snap Peas. A medium bodied, refreshing beer such as a lager or an IPA is one sure way to go when eating dishes with flavorful spices like cumin, coriander and chili powder. As for wine, typically, spicy food pairs well with white wines that have a bit of residual sugar such as a German Riesling. If you want to have red wine, I would suggest a light to medium bodied, fruit forward, low tannin wine such as a Beaujolais from France or an Italian Barbera D'Alba or even a fruity Zinfandel from California. Other great choices would be a light-bodied Pinot Noir from the Sancerre region of the Loire Valley or a Provencal rosé, preferably a fuller-bodied one from Bandol.